It’s that time of year again ... fun times over the summer holidays continue, but we all know that the start of a new school year is looming. And quickly. So instead of battling the back-to-school crowds, this year I am determined to beat the rush well before school starts. That’s exactly why I thought I would get in early and get the boys fitted for their school gear and so it was, with sand in their thongs, that we headed off to The Athlete's Foot for 2014 school shoes. I was thrilled to be invited to work with The Athlete's Foot on their #backtoshoes campaign and was lucky enough to have both Oscar and Noah's fitted for school shoes courtesy of TAF, who are sponsors of this post. The boys loved their shoe-fitting experience at The Athlete’s Foot, Ballarat. 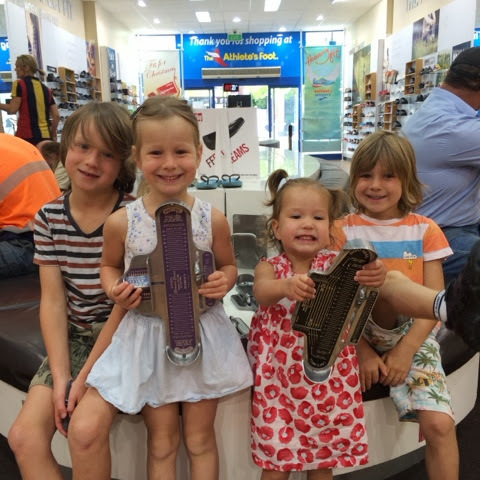 As you know, my kids don't mind a photo - just have a look at Mietta and Zali wanting a piece of the action with the foot sizing tool and Oscar's happily posing beside them with the shoe he'd just pulled off the shelf. I honestly wouldn't take the kids anywhere else to be fitted for school shoes. The kids spend so much time kicking around in them that a professional fit is a must to ensure their growing feet are given plenty of support and room for growth. Did you know that children’s feet can change up to 34 times before they reach the age of 11? So it’s all important they have the right fit for their foot from the start of their school life, don't you think, Mums? The Athlete's Foot have all school footwear needs covered and stocks quality footwear from Clarks, Ascent and more. In fact, Ascent school shoes are exclusively available at The Athlete's Foot and have become a widely trusted back to school shoe. Regardless of the brand chosen, it really is all about the fit. Mums, like me, can rest assured that with the newly launched FITZI in-store fitting experience, a member of The Athlete's Foot team will be able to equip your child's foot with the most suitable school shoe to get them off to a great school start. 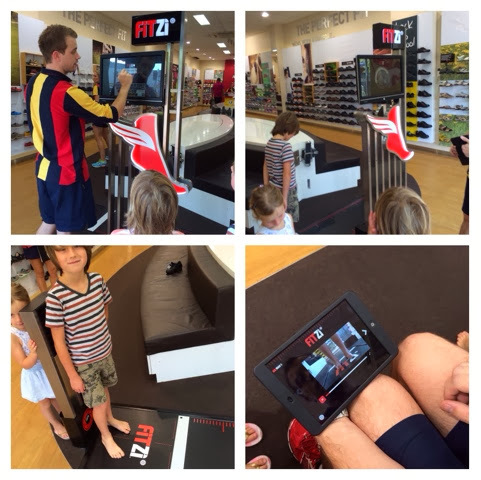 Both the boys just loved the in-store fitting experience with FITZI used by a 3-day trained "Master Fit Technicican". 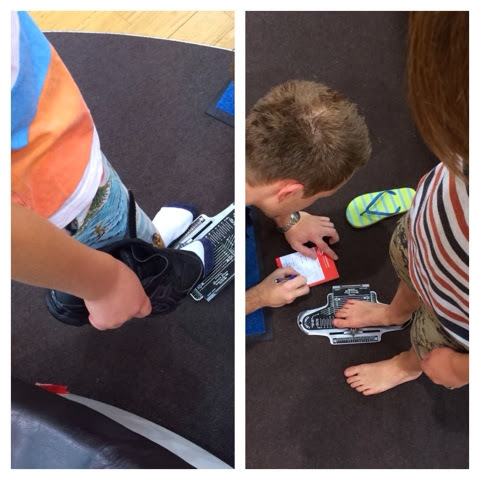 This new and exciting super technology, two years in the making, filmed and pressure-tested each of the boys to ensure they were fitted with a shoe any podiatrist would be proud of! You may remember that not so long ago, I too was fitted with a pair of ASICS and it’s great to see TAF embrace emerging technology especially when it comes to the feet of our precious little ones. We are all on our feet every day, and kids never stop running around, so this totally gives me comfort in knowing their feet are being well looked after. It was pretty mind blowing receiving such a detailed report about the pressure test of the boys feet and we received some expert feedback from the Sports Medicine Australia organization. The boys were amazed at the technology - it was like they were starring in their own sci-fi adventure! 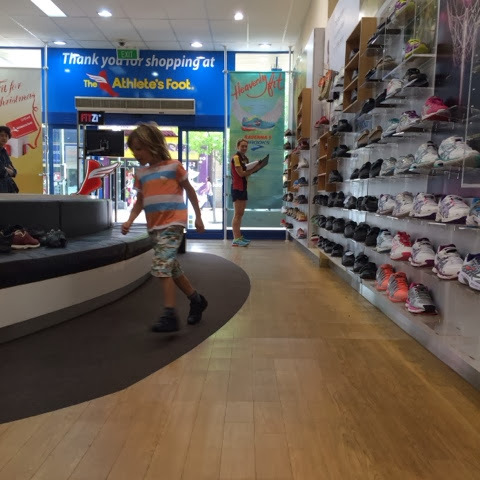 I love the fact that The Athlete’s Foot stock a huge range - not only stock their own brand Ascent School Shoes and Clarks School Shoes but they can also get you sorted for sports shoes, netball shoes, footy boots and running spikes. Any and every type of footwear your child is likely to need throughout the school year. Kids of all ages, with feet of varying shapes and sizes, are covered and for little ones, like Mietta and Zali there are plenty of velcro options available. Both the Ascent and Clarks brand came highly recommended by The Athlete's Foot staff and after trying on a range of kicks, Noah and Oscar were both successfully fitted with The Athlete’s Foot Ascent brand. Noah decided upon the Apex style, like a traditional school shoe, and Oscar was fitted with the Velcro style, the Cluster. Here are some snaps showing the business of the fitting. It started with the foot technician measuring Oscar and Noah's feet ... and then check out the amazing FITZI technology in action! Then the boys went on the FITZI to check their foot compression and balance, even got a video to play it back on the ipad. Here's Oscar running around the store to see how quick his new Ascents shoes will make him run around school in 2014! All in all it was a great experience and proudly I must say the kids were super patient and so well behaved! That and an expert team member meant we were in and out of there, perfectly fitted shoes in hand, in just over 30 minutes. What do you think, Mums? Legend or what? 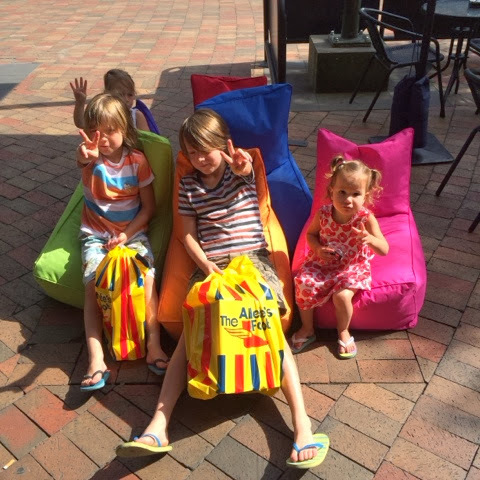 As a final seal of approval, the kids gave a peace out sign totally satisfied with their new #backtoshoes kicks!!! For more information on school shoe fitting at the Athlete's Foot you can head over to www.theathletesfoot.com.au/back-to-school and check out their new School Zone page. But ... wait ... guess what???? That is not all! I'm so excited to share with you that The Athlete's Foot is running a fantastic competition from January 08 - February 15! They have 5 packs to give away, each worth a mighty $500! Entry is super easy - all you need to do is upload and share a pic of your child's new shoes - using the #backtoshoes hashtag - on Instagram, Twitter or Facebook to be in the running. For more details and full Terms and Conditions pop over to www.theathletesfoot.com.au/promotions. Good luck, and I can't wait to see your kids and their kicks, just remember hashtag #backtoshoes to be in the running for some awesomeness!